In an effort to address the challenges of climate change and sea level rise, the City of Rotterdam has started to build some intriguing floating structures. 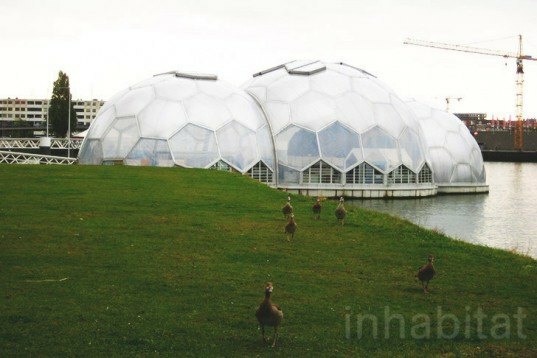 The first pilot project is a catalyst for climate change-proof architecture called the Floating Pavilion that consists of three connected hemispheres that look like bubbles anchored within the Dutch city’s old harbor. An initiative of Rotterdam Climate Proof (part of the Rotterdam Climate Initiative), the mixed-use pavilion was designed by Deltasync and PublicDomain Architects, and it sets an unprecedented example for innovative, sustainable and climate-proof architecture. Aiming to be the World Capital of CO2 by reducing fifty per cent its carbon emissions, Rotterdam has ambitious plans to adapt to rising sea levels. The idea is to build a community of floating homes, and this charming Floating Pavilion is their first prototype, presently used for exhibitions and events. The innovative pavilion meets an increasing demand for climate-proof shelters that are as flexible and self-sufficient as possible. 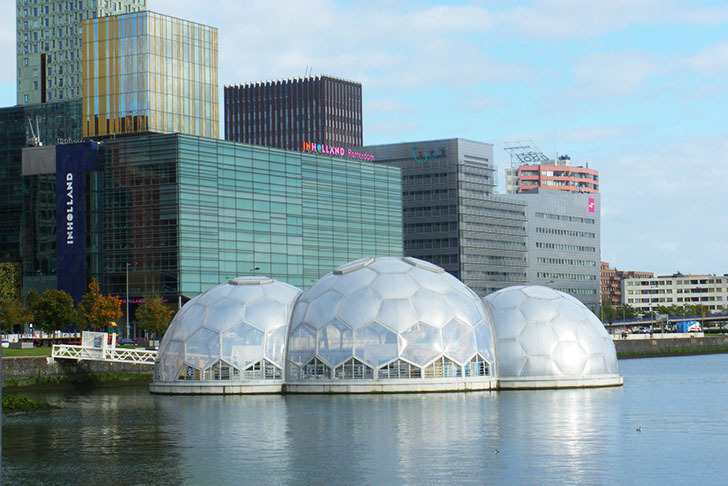 An initiative of Rotterdam Climate Proof, the bubbles were commissioned to a collaborative and local design team from Deltasync and PublicDomain Architects. Constructed by Dura Vermeer, the floating hemispheres are 40 foot tall and the total floor area is the size of four tennis courts. The translucent shelter is made from a strong, anti-corrosive plastic called ETFE, which is 100 times lighter than glass and therefore ideal for a floating structure. The shelter’s heating and air conditioning systems rely on solar energy and surface water and the systems are only used in areas of the structure where they are specifically required. The pavilion also purifies its own water to use in the toilets and whatever is left can be discharged back into the water with no negative impact. Until 2015, the pavilion will be moored within Rijnhaven, a great location because of its calm waters and easy accessibility. Rotterdam has plans to build floating urban districts–for living, shopping, working and recreating on the water–and of the 13,000 climate-proof homes planned by 2040, 1,200 of them will be on water. A realistic innovative approach to prepare for difficult times ahead, we will soon be able to admire real floating sustainable districts in this Dutch futuristic city. Aiming to be the World Capital of CO2 , the city of Rotterdam has ambitious plans to adapt to the increasing rain and rise of sea level. This charming Floating Pavilion showcases the first experimental case and is being use for sustainable exhibitions and events. The innovative pavilion adapts to an increasing demand on designing climate-proof shelters that are flexible and as self-sufficient as possible. 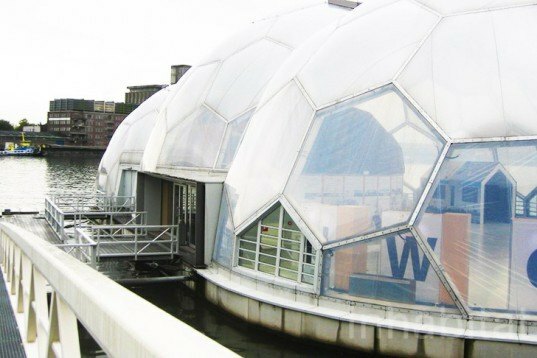 An initiative of Rotterdam Climate Proof, the bubbles were commissioned to a collaborative and local design team from Deltasync and PublicDomain Architects. Constructed by Dura Vermeer, the floating half-spheres are 40 foot tall and the total floor area is the size of four tennis courts. The translucent shelter is made from a special and strong high corrosion resistance plastic called ETFE, 100 times lighter than glass therefore ideal for a floating structure. The shelter’s heating and air conditioning systems rely on solar energy and surface water and it is only used in places where it is specifically required. The pavilion also purifies its own water to use in the toilets and whatever is left can be discharged back into the water with no negative impact. Until 2015, the pavilion will be moored within Rijnhaven, a great location because of its calm waters and easy accessibility. Rotterdam has plans to build floating urban districts, and from the 13,000 climate-proof homes planned by 2040, 1,200 of them will be on water. A realistic innovative approach to prepare for difficult times ahead, we will soon be able to admire real floating sustainable districts in this Dutch futuristic city.